In line with the packaging and labeling industry, the stretch sleeve and heat shrinks labels is witnessing a tremendous surge across the world. The rising base of the global population, increasing disposable incomes and the purchasing power of people in emerging economies, escalating preference for packaged food, and the augmenting trend of urbanization are the key factors, which are driving the growth of the worldwide market for stretch sleeves and heat shrink labels substantially. The market’s opportunity is expected to rise remarkably over the next few years. By 2017, it is expected to reach US$10.43 bn. Further, it is estimated to expand at a healthy CAGR of 5.90% during the period 2017–2022 and rise to US$13.91 bn by the end of 2022. Broadly, the global market for stretch sleeve and heat shrink labels is evaluated on the basis of the type of the product, application, and the printing technology. Stretch sleeve labels and shrink sleeve labels are the two prime type of products available in this research report. The demand for shrink sleeve labels is comparatively higher than stretch sleeve labels, thanks to the better printing capability and visual qualities of shrink films, which make them more suitable for advertising of products. With the increasing usage of shrink sleeve labels for the labeling of bottle and the packaging of beverages, this product type is expected to remain the most favored one in the global market over the forthcoming years. The food and beverage, home and personal care, pharmaceutical and healthcare, industrial consumables, and the retail sectors have surfaced as the key application areas for stretch sleeve and heat shrink labels, globally. Rotogravure, flexography, and digital printing are the prime type of printing technologies utilized in stretch sleeve and heat shrink labels. The worldwide stretch sleeve and heat shrink labels is also analyzed on regional basis. In terms of the region, the market is categorized into North America, Latin America, the Middle East and Africa (MEA), Asia Pacific excluding Japan (APEJ), Europe, and Japan. The significant economic growth in APEJ has boosted the uptake of stretch sleeve and heat shrink labels in this region, resulting in the dominance of the APEJ market for stretch sleeve and heat shrink labels. The increasing industrialization in various Asian economies, such as India and China is also supporting this regional market considerably. Researchers predict the APEJ market to remain seated at the top position over the next few years, thanks to the increasing government investments in the packaging and labeling industry in India, China, South Korea, and various Asian nations. 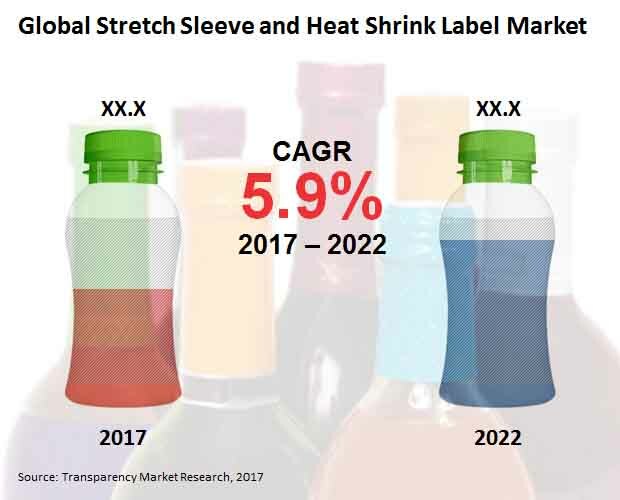 Latin America, Europe, North America, and Japan are also projected to report substantial growth in their respective markets for stretch sleeve and heat shrink labels in the years to come. The Latin American and the Japan markets are expected to gain from the strengthening of economy while the markets in North America and Europe are anticipated to benefit from the presence of numerous established market players. The presence of a large pool of players creates a competitive business landscape for the global market for stretch sleeve and heat shrink labels. International Papers, Berry Plastics, Cenveo, Macfarlane Group, CCL Label Inc., The DOW Chemical Co., Hammer Packaging, Fuji Seal International Inc., Klockner Pentaplast Group, and Huhtamaki are the main vendors of stretch sleeve and heat shrink labels across the world. The global market for stretch sleeve and heat shrink labels is primarily a consumer oriented market. With a significantly large pool of regional and multinational companies, the market is extremely competitive as well. This report presents a comprehensive study of this market on the basis of its current and historical performance. The key trends, drivers, restraints, challenges, opportunities, future potential, and growth rate have been studied at length by the team of researchers to carry out this research. The worldwide market for stretch sleeve and heat shrink labels is broadly assessed on the basis of the type of the product, application, printing technology, and its regional spread. In terms of the type of the product, the market is classified into stretch sleeve labels and shrink sleeve labels. By the application, the market is segmented into the food and beverage, home and personal care, pharmaceutical and healthcare, industrial consumables, and the retail sectors. Based on the printing technology, the market is bifurcated into rotogravure, flexography, and digital printing. Geographically, the report classifies this market into North America (Canada and the U.S.), Latin America (Argentina, Brazil, and Mexico), the Middle East and Africa (South Africa, Turkey, Israel, and GCC countries), Asia Pacific excluding Japan (India, China, South Korea, Indonesia, Australia, and Singapore), Europe (the U.K., Italy, France, Germany, Spain, and Nordic countries), and Japan. In an effort to compile this report, detailed discussions with a number of market experts and key participants have been conducted. The primary research signifies a bulk of efforts in research, supported by an extensive secondary research. The product literature published by key players, press releases, annual reports, and several relevant documents have been thoroughly reviewed while analyzing the competitive landscape of the global stretch sleeve and heat shrink labels market, which helped in strengthening as well as validating the findings of the secondary research. The primary research further assisted in developing the expertise and the market understanding of the analysis team at Transparency Market Research (TMR). The secondary research sources, which are referred to consist of, but are not limited to, the websites of the companies, their financial reports, annual reports, broker reports, investor presentations, and SEC filings. Various other sources, such as databases of internal and external proprietary, statistical databases, news articles, government documents, and several webcasts specific to companies functioning in this market have also been referred by analysts for this research report. International Papers, Berry Plastics, Cenveo, Macfarlane Group, CCL Label Inc., The DOW Chemical Co., Hammer Packaging, Fuji Seal International Inc., Klockner Pentaplast Group, and Huhtamaki are the leading players in the global stretch sleeve and heat shrink labels market mentioned in this study. The research report further offers a detailed overview of the competitive scenario of this market, examining various information, such as the market share of each of the key market players. The profiles of the main companies, which include the overview of the company, brand overview, financial overview, business overview, business strategies, key competitors, recent developments, and the number of employees, have also been evaluated in this study to determine the hierarchy between them.